My Update: This weekend we’re planning a day out that will involve a lot of apple fritters, spiced donuts, fresh pies and hot apple cider. We’re going to an Apple Festival in our neighborhood and to prepare myself for the food fest, I’m eating “light” this week. This means watching what I eat and how much. The last thing I want is to go have a fabulous time, but feel guilty. I mean, someone has to try all of the chocolates and cupcakes at the various cafes we’ll be visiting, right? Truthfully, I’ll be super happy if I can get my hands on a decent apple fritter. I’ve gone off my local grocery’s version (too oily) and I’ve been on the lookout. On the weekends, I bike. Weekends are notoriously more calorie ridden than weekdays. Since I know that I’ll be eating more than usual, I schedule in bike rides to burn those calories. A 10 minute bike ride at a moderate pace can burn almost 3 times the calories as a walk of the same length. I normally do three 20 minute programed routines for an hour of biking. Biking involves little involvement. I can peddle and distract myself quite easily. This is good since it means the time goes by more quickly than if I scheduled in an aerobics session. Biking helps build my stamina and endurance. If I do it on the weekend, it “blocks” in my other routines that I have scheduled for the week. Since I normally lift weights on Monday and Friday, biking means I can really work out the legs so that I’ll be ready and rested for my upper body work on Monday. Since we own a bike, I can do whatever I want while I peddle. I can’t read like some people, but I do watch television – anime in particular. Currently I’m watching two shows: Natsume Yuujincho San and Usagi Drop. Both are highly recommended. They’re full of love and they’ve brought a tear or two to my eyes as I biked my way through episode after episode. 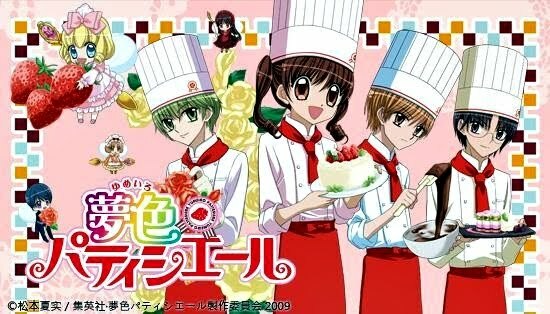 The anime I want to focus on today, however, is Yumeiro Patissiere (and the second season Yumeiro Patissiere Professional). Early Thoughts: Going into this anime, I wasn’t sure if I would like it. For one, it’s a bit kiddy. Spoiler-free Quick Synopsis: Ichigo is a young girl who decides one day after tasting delicious sweets to become a patissiere just like her grandmother. She enrolls into an “elite” cooking school and learns to bake while making friends. Oh, yes. And there are fairies involved called “Sweets Spirits”. I can take kiddy just as long as it has a good story to go with it. Seeing as how this particular anime centered around baking, I wanted to give it a shot. I’ve done a few other “cooking” manga/anime before: Yakitate! Japan and Kitchen Princess being the more recent. Both were really addictive and fun (even with some plot defects that appeared later in the series), and I liked the idea of biking while watching others make sweets. Warning: They make a LOT of sweets in this anime. So many desserts are just whipped up on a whim that it can be a bit triggering for those that are trying to stay away from sweets. Personally, it didn’t trigger me at all. If the desserts were actual photographs, then that would be a different story. As it was, the animation made them just unreal enough to not set me raiding the kitchen right after my bike ride. If you can’t even hear the word “cinnamon” without craving buns (actually, that’s me…), then you might want to avoid this one. Character and Plot: I loved the way this story unfolds. It starts with us getting to know our klutzy heroine as she fumbles her way through cooking class. We grow with her as we learn cooking techniques and baking terms. Sometimes I began to wonder what school would actually request their students to bake mille-crepes for an assignment and allow them free-access to the kitchens, but all the situations she gets herself in are believable. Course, there’s the small matter of the Sweets Spirits (tiny fairies or sprites that come from a Sweets Kingdom to apprentice with a human patissiere), but they only add comedy relief and don’t usually get in the way of the main story. Once she progresses beyond beginner baker, they start the main story: the Gran Prix. She teams up with the best bakers at the school: the Sweets Princes. Each “prince” is good at a particular aspect of cooking such as chocolate, Japanese sweets, and candy craft. They compete with other students for a chance to win a year at the Paris branch of the school. There’s a little romance (very, very little), a lot of comedy and even a bit of heart. There’s also a fair number of surprises that caught even me off guard. The show also doesn’t get old even though they have numerous competitions (this is a downfall that most anime can’t get out of – Yakitate! Japan being the most notable out of the cooking anime). Final Verdict: I loved watching this anime as I biked. It isn’t intense, but lighthearted so I didn’t feel dragged down as I worked through a routine. The story was interesting with frequent cliffhangers that really helped me to get through a ride. I found the characters fun to watch and was very sad when I got to the last episode. The spin-off/sequel isn’t quite as nice to watch as the original series, but it’s still fun and amusing. I highly recommend watching it since it’s a fun diversion and it even inspires one to try out difficult techniques (if they can do it, then why can’t I? ;). Categories: ELB, Review | Tags: Anime, ELB, japanese, Review | Permalink.